Make tomato sauce the easy way! 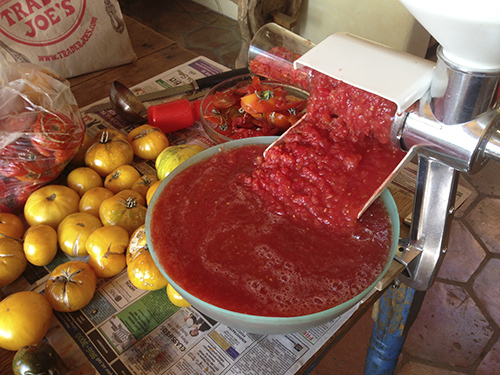 By now you’ve probably finished harvesting and making your tomato sauce but I have to share how I do it. 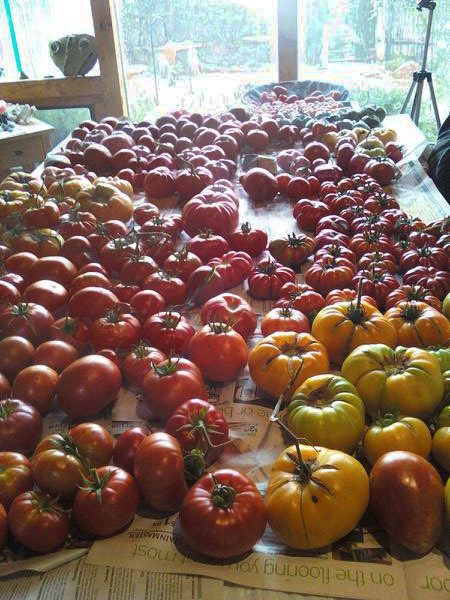 I grow many tomatoes each year and make LOTS of tomato sauce as a result. But canning it doesn’t happen until late fall after harvest season is done. I use to make it the old fashion way of putting the tomatoes in boiling water until the skin splits, then putting it in ice water to stop cooking, then peel off the skin and squeeze the tomatoes and juice in bowls to freeze. Tiring—very tiring and it takes lots of time. 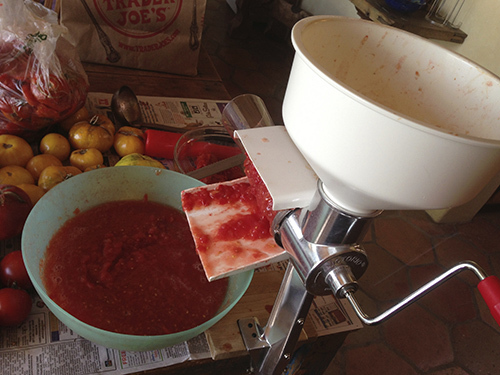 Now I make tomato sauce the easy way. I finally got a food strainer (sometimes called a food mill) that separates the skins and stems from the pulp, juice and seeds making an uncooked tomato sauce in record time. My food strainer is from Victorio. It comes with one screen that is fine mesh. I also got the salsa screen because I want my sauce thicker. 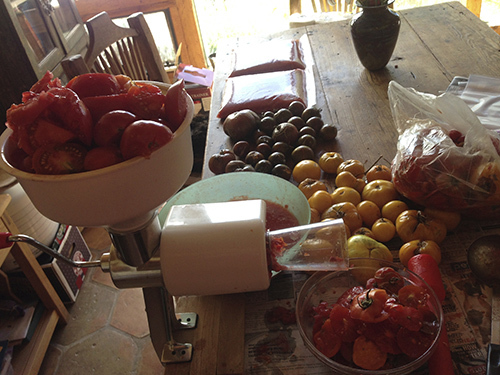 I can process about 20 lbs of tomatoes in 10-15 minutes. But let’s start from the beginning. First you’ll need some tomatoes. 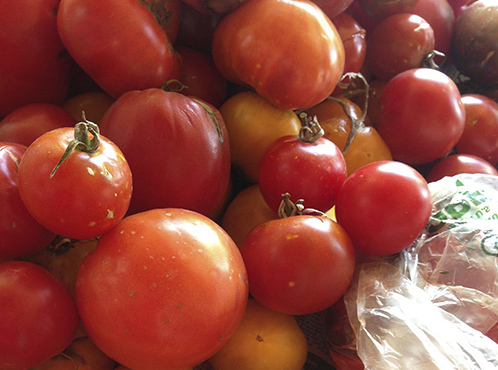 Good and imperfect blemished tomatoes are perfect for making sauce. These had hail damage but tasted good. 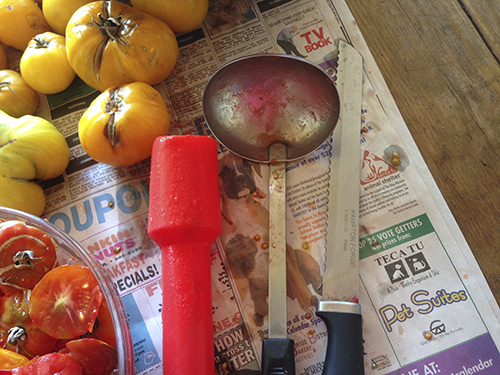 Here are the tools-a plunger to push to tomatoes through (comes with the food strainer), a ladle, and a serrated knife to cut the tomatoes in chunks to fit in funnel. This process is messy so cover your table! Cut up and put the tomatoes in the food strainer funnel. No need to take off skins, the strainer will do it for you. Here is some sauce partially done. The food strainer has separated the sauce out into this green bowl. 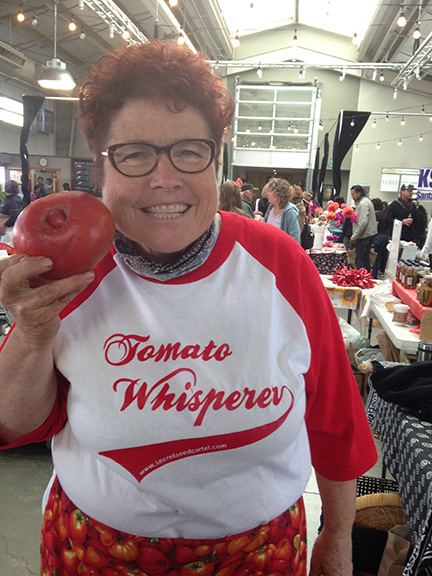 You crank the handle and push the tomatoes into the funnel using the red plunger. The strainer reminds me of a meat grinder except it grinds up tomatoes instead. It also can be used to make grape juice from grapes and applesauce or apricot sauce. The other side of the food mill spits out the skins. I also cut off the stems shown in bowl. The chickens will love getting this bowl! 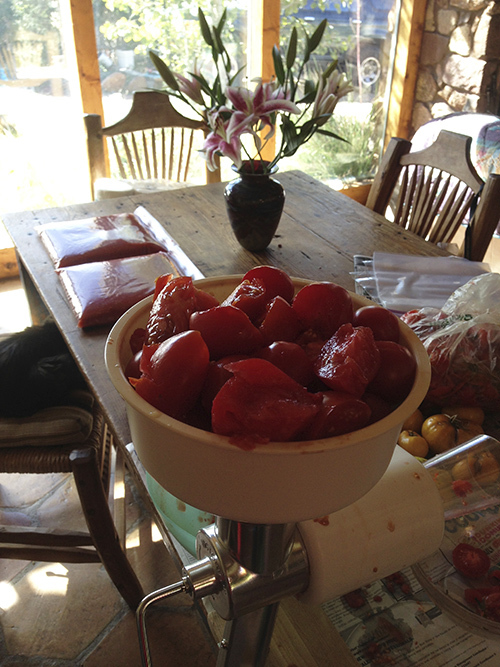 Here is the bowl full of rich raw tomato sauce ready to bag with more tomatoes in the background ready to make sauce. 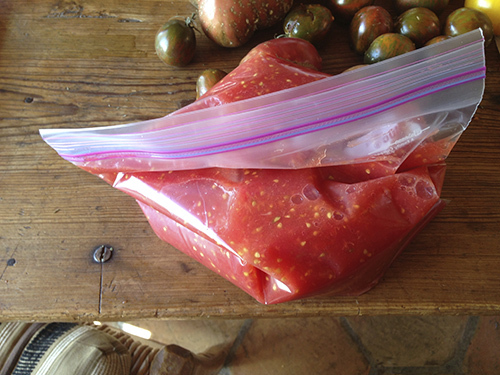 I put about 12 cups of raw tomato sauce in a gallon size freezer bag. I don’t like to overfill them. I also squeeze out the air while I ‘zipper’ them up. Be sure you zipper it well or it could leak out when you lay it flat. 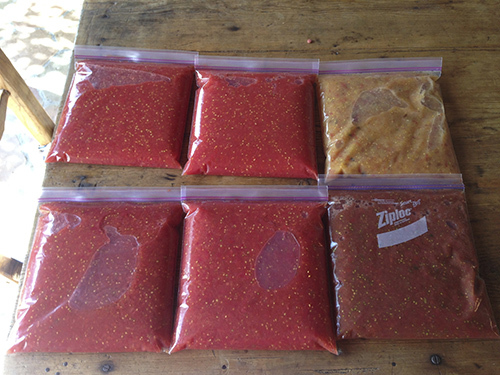 Here is the raw tomato sauce—bagged and ready to freeze. Notice I have different colors of sauce coming from different colors of tomatoes. Later I either cook the bags of raw sauce up for a recipe or I end up canning them when my freezer is too full and I’ve recovered from harvest season! 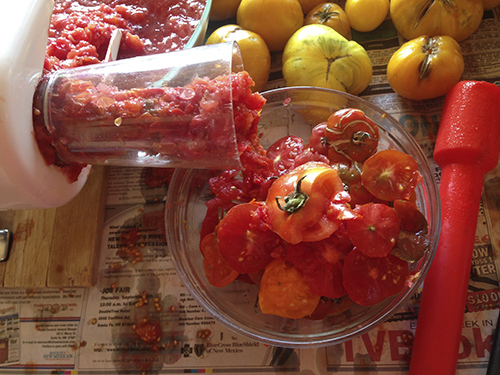 This entry was posted in 'THE TOMATO LADY', general, PRESERVING FOODS, RECIPES, tomato sauce and tagged fall vegetable gardening, food strainer, making tomato sauce, preserving tomatoes, tomato sauce, tomatoes.